The sky on April 28, 2006 at 9:30 p.m. local time from mid-northern latitudes. 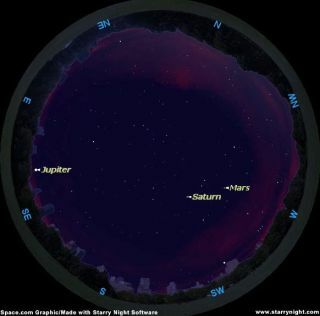 There are now three "superior" planets that are readily visible in our early evening spring sky: Mars, Saturn and Jupiter [Map]. A superior planet is defined as one whose mean distance from the Sun is greater than that of the Earth. During the late fall and winter, Mars and Saturn were at their best when they reached their respective oppositions to the Sun (Mars on November 7, Saturn on January 27). At these occasions, besides shining at their very brightest and appearing largest in telescopes, these two planets were visible for the entire night, rising at sunset, attaining their highest point in the sky at midnight and setting at sunrise. And this week, Jupiter will be arriving at opposition (on May 4). But since its November opposition, Mars has diminished to a faint little nothing compared to what it once was. During the month of May, increases its distance from the Earth from 178 to 200 million miles and is in the western evening sky, appearing only a fraction as bright as it did half a year ago. It continues to diminish in brightness from magnitude 1.5 to 1.7, making it comparable in brightness to the nearby "Twin Stars" of Gemini, Pollux and Castor. Saturn, too has diminished somewhat in brightness since midwinter, but unlike Mars, is still putting on quite a show. First is the weather factor. During the winter season temperatures on many nights for most parts of the country were no doubt quite cold to downright frigid making prospective observers extremely uncomfortable. Now, in recent weeks, there has been a noticeable moderation of the chilly nighttime temperatures; a trend that will continue in the nights to come. The second reason is the placement of Saturn. A few months ago, you would have had to wait until late in the evening or the middle of the night for it to climb high up into the sky. Now, that wait is over. The ringed beauty is well situated for viewing as soon as it gets dark. It now appears as a yellowish-white "star" of magnitude +0.3 in the dim constellation of Cancer, and can be found more than halfway up in the south-southwest sky as darkness falls at the beginning of May. Saturn's famous rings, of course, make it the telescopic showpiece of the night sky. The rings are currently tilted at an inclination of 20-degrees toward the Earth. As we noted in January, you should take full advantage of this circumstance, because, we won't see the rings tipped 20-degrees or more to our line of sight again until the year 2014! Saturn now sets just after 2 a.m. local daylight and a couple of hours earlier by the end of May. On the night of May 3, a fat crescent Moon will appear to hover well to the right of Saturn as they descend the western sky. But this is only the first of two Moon-Saturn pairings in May. A crescent Moon only about half as wide will appear to pass about 3 degrees above Saturn on the evening of May 31. The third reason is that Saturn will be especially "showy" in the weeks ahead, especially on June 5 when it will be positioned just south of the beautiful Beehive Star Cluster which appears as a swarm of stellar points in binoculars. This pairing should make for a very pretty sight. Finally, there is Big Jupiter. He can be found glaring low above east-southeast horizon at dusk during the early evening hours, the brightest "star," in the sky and inviting inspection the moment you set up a telescope. Wait, however, until a couple hours after sunset for it to gain some altitude above the horizon haze. Since it will be at opposition on May 4, it will appear highest in the sky, toward the south at around 1 a.m. local daylight time, then descends toward the west for the rest of the night. As seen from Earth, Jupiter is retrograding, or moving west through the dim stars of the zodiacal constellation of Libra, the Scales. Its dark belts and bright zones with their subtle markings resolves into a series of red, yellow, tan and brown shadings in most telescopes, and of course its four large and bright moons can be followed for hours, even in steadily held binoculars. Through a telescope you can watch as they speed in front of Jupiter, throwing their shadows on the planet, or vanish behind its disk or suddenly becoming eclipsed by its shadow. Jupiter has the largest apparent disk of any bright object in the sky after the Moon and the Sun. He's truly the superior of the superior planets!